This page contains information about rehearsals, in particular about any late changes to location and timing of rehearsals and, additionally, the dress requirements for concerts. Recruitment poster for 2019 - The new poster (pdf) can be downloaded from here. Feel free to download it and email to all your friends. The image of the pdf is on our Facebook page. 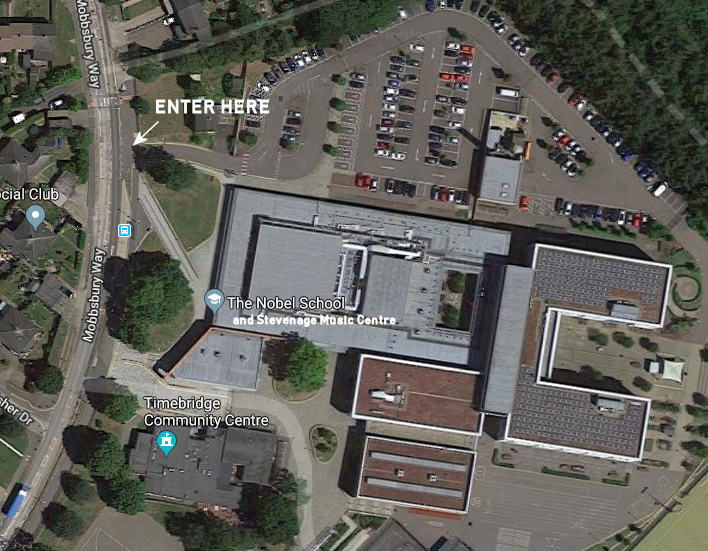 Rehearsals will normally be at the Stevenage Music Centre (click on link for Satellite image). For those using SatNavs to get there the post code is SG2 0HS. The address is Mobbsbury Way and is adjacent to the Timebridge Community Centre. Please note: The satellite image is, I believe, not right up to date. The car park entrance is more or less adjacent to the letter "a" in Mobbsbury Way. There's lots of parking there, just leave the car and walk to reception and there will be someone there who can guide you to the auditorium where we rehearse. Notes: ** - Optional Rehearsal - TBC. For those that want to plan their dates further ahead then click here (to view the calendar through to July 2019. Do remember to check these dates on an occasional basis - they are updated sometimes throughout the year. This will be provided for all the music (hopefully!). NO support for the short pieces we will be singing. I&apos;ll provide what I can given the limits that it may be difficult finding the specific arrangements of pieces we will sing, so there will be more here as time goes on. You can hire the music via us. Hire cost: £ 5.50. Novello Choral Pops - This can be bought at Amazon.co.uk for £11.45 (with Free delivery), Also at Forwoods Scorestore.co.uk for £10.44 (plus £2.50 P and P costs for orders less than £15 otherwise free) with price per unit reduction if you order more copies. Novello - The greatest Choral Classics from Amazon.co.uk at £10.95 (with free delivery) and also from Forwoods Scorestore.co.uk for £10.40 (plus £2.50 P and P costs for orders less than £15 otherwise free) with price per unit reduction if you order more copies. Boosey and Hawkes - Sing Britannia from Amazon.co.uk at £18.10 (with free delivery) and also from Forwoods Scorestore.co.uk for £9.74 (plus £2.50 P and P costs for orders less than £15 otherwise free - cuurently on 25% reduction) with price per unit reduction if you order more copies. Derek Harrison passed over some papers about vocal care and guidance on Monday 2nd February 2015. As some were a little pale (and on an angle - a little bit) I have re-typeset the text. To view/download the text click here. Events brought to our notice can be found by clicking here. Currently there are TWO events there. An explanatory page about this relatively pain free method of donating funds to us (when you buy things over the internet) can be seen by clicking here. Jan has been passed some pointers to YouTube videos about breathing (with exercises):- 1, 2, 3, 4, 5 and 6. Numbers 1 and 2 are associated and numbers 3-6 form a video in 4 parts. These have been removed from the site but is available on request if needed. This information is available on request via the Society Chairman. IF you are lucky/unfortunate enough to find an error on any of the pages of this site then PLEASE let me know. I've made life as simple I can. There is a link to click on the "Contacts" webpage that will start a mail message to me. It would help lots if you can make the title of the E-mail the name of the webpage(s) with the error(s) on it. Footnote: The link to reach this page will be on the main page of the site (index.html) and will be set to red (for typically a week) as a trigger to show that new information is available here. So please check the main web page regularly.